Quick prototyping allows to discuss actual use cases! Our philosophy behind PEACOCK is simple. We believe the biggest obstacle between HR staff and Data Scientiest/IT is communication. 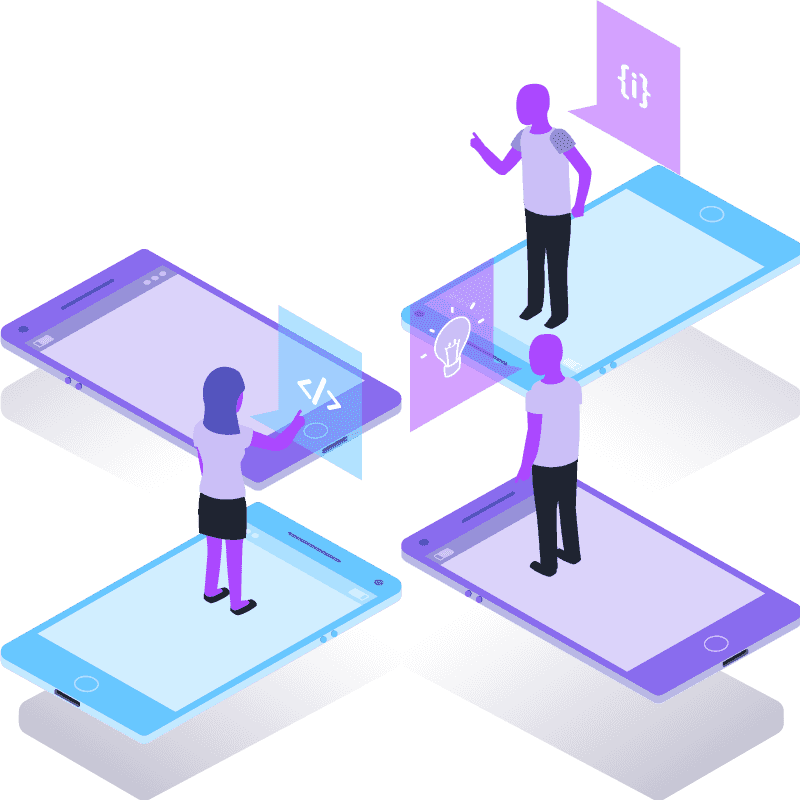 We know from experience, that using prototypes to discuss and test use cases, is a key success factor. 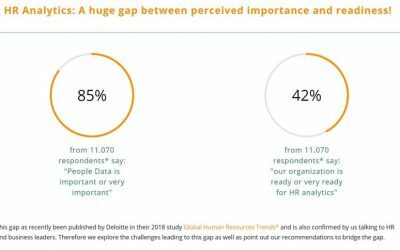 Quantification of commercial impact as well as process automation are a key success factors to bring business and HR together. Do not let your high performers leave! 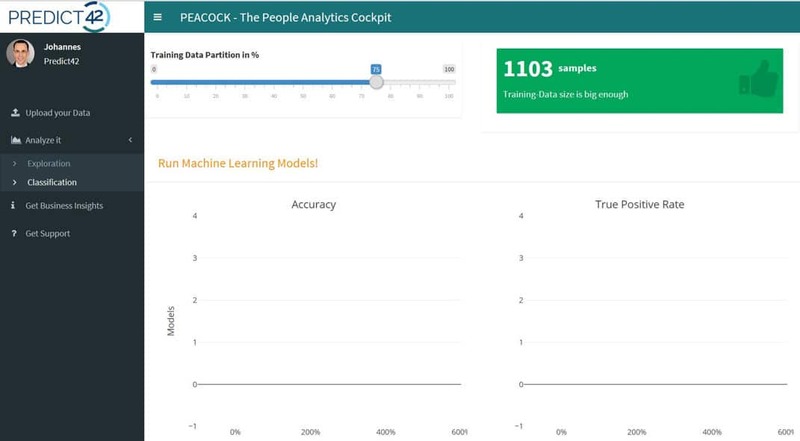 Peacock is a platform for rapid prototyping for people analytics use cases. In the app we feature a decision support system, which allows HR staff & business leaders to quickly determine, who of his/her staff members is in danger of leaving the company. We are hosting the peacock application in your own stack or a secured environment with only approved users having access. Our app allows you to get started immediately by pressing the button “Use demo data” and thereby uploading a set over 1.500 people of a representative sample. 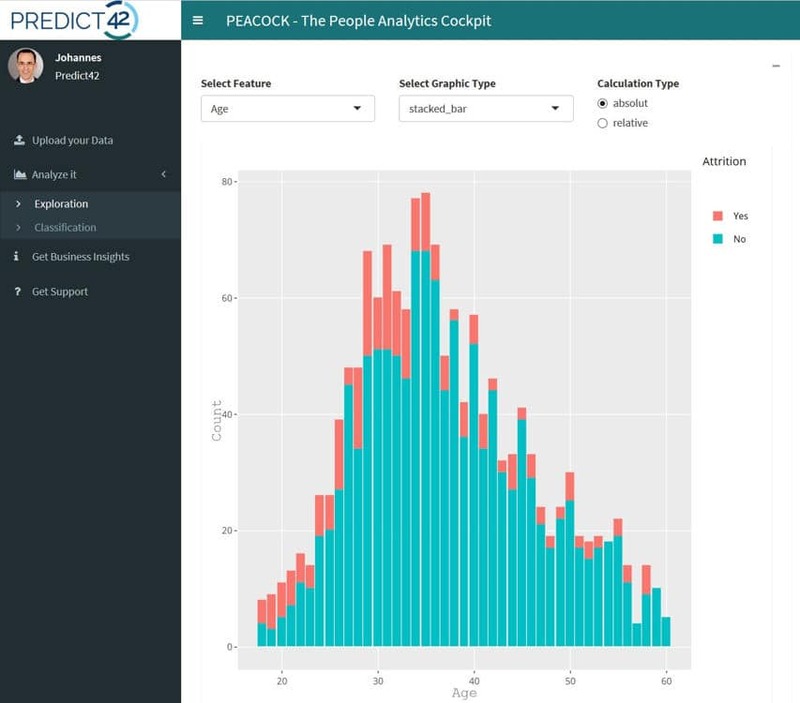 In our premium version you can also upload your own data. A natural first step is to explore the nature and the distribution of your variables. We allow for different forms of visualization. Now it is time to train your model. We allow for easy partioning of the training set. Right now we have two models (Random Forest, Gradient Boosting Machine). 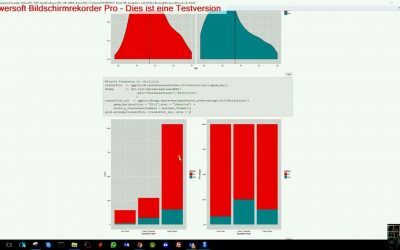 For the actual prediciton, the app chooses the model with the higher accuracy. 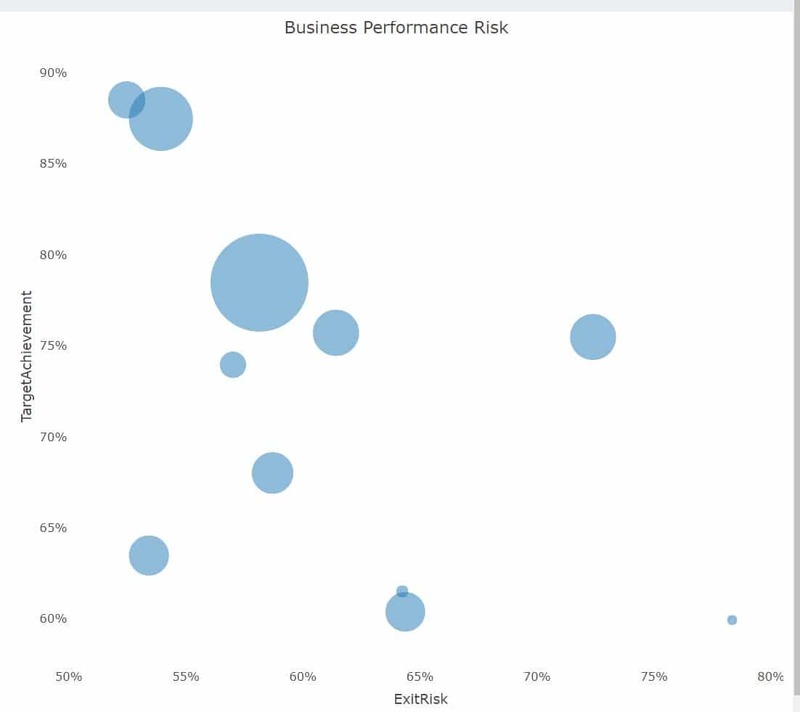 Once the models have run, you can click on the menu item “Get business insights” and explore the results. You can easily filter/sort your employees based on the risk of exit, by income or other dimensions. We calculate your total cost of attrition. 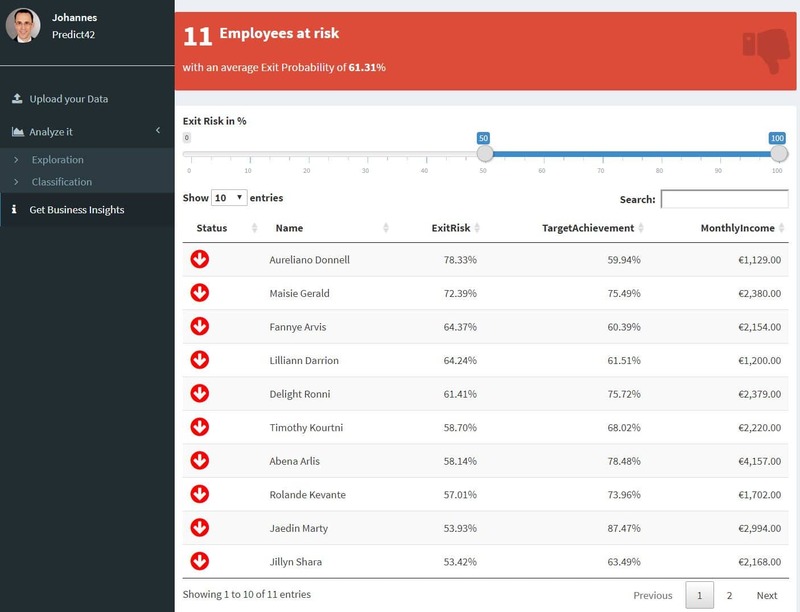 Also we plot the exit risk and the performance rating, allowing to quickly determined which high performing employees are most endangered. 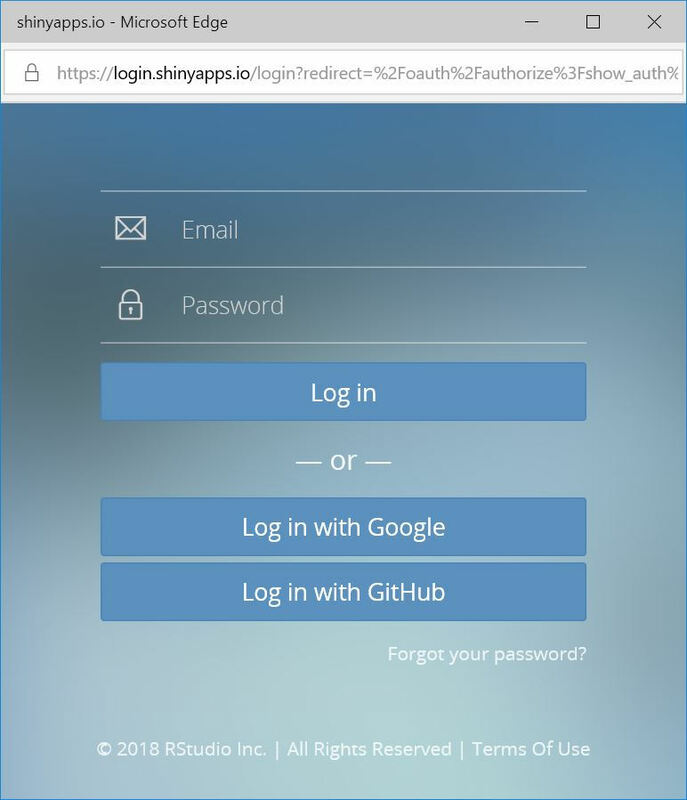 Run our scripts or apps within your own stack or use our app.